Because the eyeglass case you can find might be different size and all, I am not going to give measurements and such. This is a brief how-to-post. 1. Cut fabric for the inside and outside of the case. For outer fabric, make sure that you have enough to cover the whole thing and tuck inside the case. For inner fabric, cut the edges with pinking shears to prevent fraying. 2. It is helpful to use a small dish and such to trace the curve and cut the corners. Also, fold the fabric horizontally in the middle, cut into about an inch or so from both sides to make it easier to hold the fabric in around the hinges. 3. Spread the mod podge onto the case evenly and carefully place the fabric. Make sure there are no air bubbles. Then attach the inner fabric in the same manner too. 4. I pasted small ribbons around the hinges area to hide the "ugly" part that I couldn't get quite right. If you don't need it, you can skip this part. 5. Make a small pincushion. All you need to do is measure the inside of the case and decide how big you want the pincushion to be. Don't forget to add an inch or so to the measurement, when you stuff it, the length and width will "shrink" (because it gets puffy). Glue the pincushion inside of the case. That's how I made this sewing kit case. Do you wanna see the inside? Absolutely adorable project! These would make wonderful stocking stuffers. Sharing on my Facebook page! Nice idea and gorgeous fabric !!! This is awesome! So creative! Oh I like this! I probably would use it to store knitting notions in my knitting bag. What a great idea! I love it! Most glasses wearers have old cases that they could jazz up. Making pressies from your stash is not only budget friendly, but good for the environment too. I'm going to share this! super darling - & I LOVE the fabric you used for it...cute cute cute! Great idea! Thanks for sharing it. I have 2 or 3 old cases around from out of date pairs of glasses. I also think they would make good pencil/pen cases for my sketch kit(s). Such a great idea - thanks for sharing it. You're too clever! I love this! Want it for me and going to make one. Great idea to tuck in the purse and be ready for any sewing emergency. Thanks for sharing. This is a perfect idea!!! I have several eye glass cases laying around... Sure glad that I didn't toss them out!! Your blog is just fantastic with so many lovely ideas. very cute!! 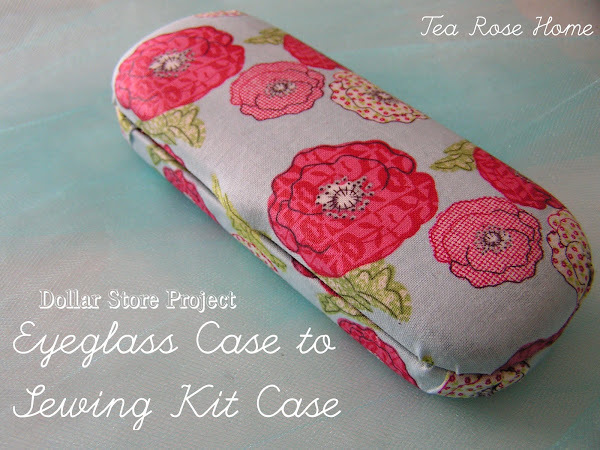 love the fabric choice and a nice way to upcycle--we who get glasses every year or two have some of these cases just waiting for a good idea. I think I'll add in a couple little elastic bits to hold scissors and such. i saw this on Pinterest and loved it right away. c'est une superidée, merci pour le tuto, j'adore !!! Love this! Wonderful gift, even for myself! What an absolutely brilliant idea! I love it - perfect for the travelling needlewoman! Thanks so much for the inspiration. How about gluing a magnet in the lid to hold your needles and scissors. I loved this idea. Who does not have a ton of these laying around? Such a great idea! One to have in my desk at work would be awesome. So clever and thank you for sharing your wonderful idea. The minute I saw this I went to my husband's clothing draw to find a case. Did you realize that you posted this idea on 12/12/12??? Love this. I'm going to make this for my secret Santa this year.. One for the office drawer would be useful too. Great ideas from every one I can't wait to make one. Love this idea! Brilliant job, thanks for sharing!